The excavation of Trench 2 continues and several artefacts are recovered, including sherds of prehistoric pottery, a fragment of a flint arrowhead and a stone spindle whorl. Excavation work continues in Trench 2, cleaning back the surface in the east sector of the trench that comprises fire-cracked stone and pebbles. Near the east edge of the trench, in a slight depression, Martin uncovered several sherds of prehistoric pottery, some of which refit together and include two rim fragments. The pottery is a light grey in colour and may have burnished surfaces. Several small fragments of heavily burnt bone were also recovered, while Steven uncovered what may be packing for a post-hole in the northwest sector of the trench, within the tumbled wall of granite boulders and cobbles. Martin excavated a one-metre wide slot trench in the east corner of Trench 2, extending through the wall of the U-shaped structure, where a layer of fire-cracked stone seemed to be extending under the wall of granite cobbles. After removing the overlying granite boulders and cobbles, Martin found that the layer of fire-cracked stone extended below in a low raised mound, possibly indicating an earlier structure, or a burnt mound? This will have to be resolved by extending the trench through the full width of the wall of the U-shaped structure, which measures in excess of 3 metres wide at this point. Figure 1. The sectioned post-hole and packers located in the northwest sector of Trench 2 (Scale=0.25m). As we continued to excavate through the layers of sediment containing fire-cracked stone in Trench 2 we recovered several artefacts, including the broken-off tip of a barbed and tanged arrowhead (in a grey flint), a flake of grey flint, a pebble hammer, two possible lumps of haematite (red ochre), two small pebbles (possible smoothers), two lumps of green-coloured rock (ore? ), a piece of iron-working slag, burnt bone and small fragments of charcoal. The finds were most dense in the northwest sector of the trench. By the 10th March we were still excavating through layers of fire-cracked stone and sediments, with no apparent change in the context. There were fewer finds from the Trench today, although slightly larger pieces of burnt bone and charcoal were recovered. A few fragments of metalworking slag, flint flakes and haematite were also found. One of the pieces of flint had part of the cortex in place and seems to be derived from beach deposits. However, George made the best find of the day in the west sector of the trench, adjacent to the ruined wall. 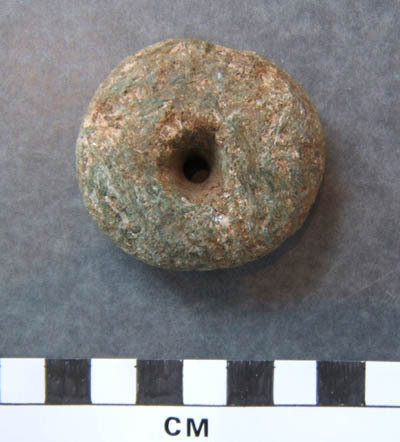 Here, he recovered a fine spindle whorl made from a stone with green crystals on its surface. The hole through the piece is the typical hourglass shape, much like holes through rotary querns. Figure 2. A stone spindle whorl from the northwest sector of Trench 2. Before the use of spinning wheels, spinning was carried out with a spindle and a whorl. The spindle, or rod, usually had a swelling on which the whorl was fitted. A wisp of prepared wool was twisted around the spindle, which was then spun and allowed to drop. The whorl, acting like a flywheel adds momentum to the spindle. By doing this the fibres were extended and twisted into a yarn. These types of whorls first appear in the Iron Age or earlier and were still popular in the early Historic period. Weather permitting, work will continue on Trench 2 next week.